Chickens and gardening: in some ways, these two hobbies are incredibly compatible. After all, chickens eat plant pests. Their droppings and litter can be converted into some truly fantastic compost. And there’s a certain symmetry in making choices that allow you to produce eggs, fruits and vegetables on your own little family farm. Local food can hardly get any more local than if it comes from your own yard! But in many ways your chickens can be at odds with your garden. Yes, they eat plant pests… but they also eat beneficial bugs. They’re not going to simply gobble your potato beetles and ignore your lacewings! Plus, they’ll trample or eat your new seedlings and young plants, if you let them. Further, what they don’t eat, they may scratch up, looking for grubs or wallowing holes for dust bathing. And while the composted manure will be fabulous, they’re not going to confine droppings to the coop or the compost pile. They’ll also poop on your sidewalk, your porch, your patio and your lawn furniture. This is not your bench. This is our roost. Got it? This isn’t to say you can’t realize your vision of having chickens and gardening, of course. But this IS fair warning: make sure to plan your garden and/or your chickens accordingly. 1. Contain your chickens away from the garden. One of the best ways to combine chickens and gardening is simply to keep your chickens confined to a run. Common sense, right? However, this doesn’t appeal to everyone (myself included). For one thing, keeping them in one area cuts down on the amount of bug control they can do. For another, if you had idyllic visions of having your flock freely roaming your yard, while you enjoyed the “beautiful breed” eye candy with a frosty beverage, it’s definitely not the same! A fenced run doesn’t have to be an unpleasant place! Still, watching your chickens enjoy a fenced run area still has plenty of charm when they have a large are that you properly maintain. 2. Use a chicken tractor inside your garden. 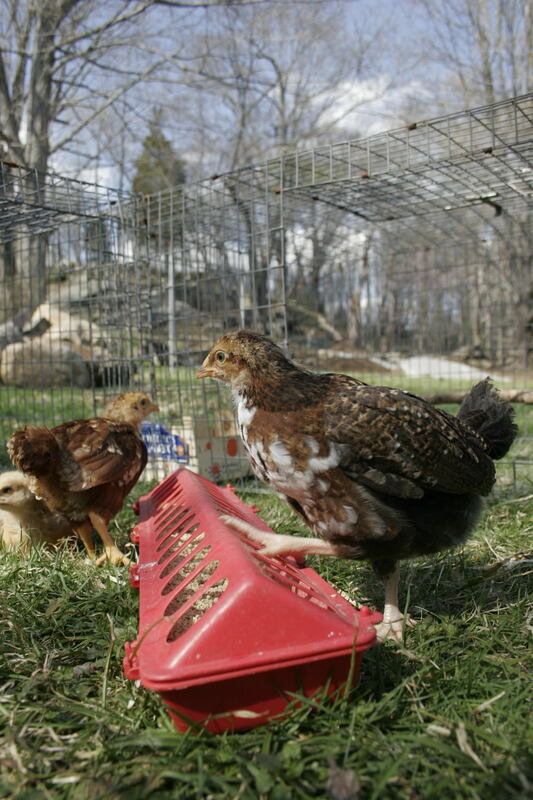 In some instances, you can contain your chickens within your garden instead of outside it. 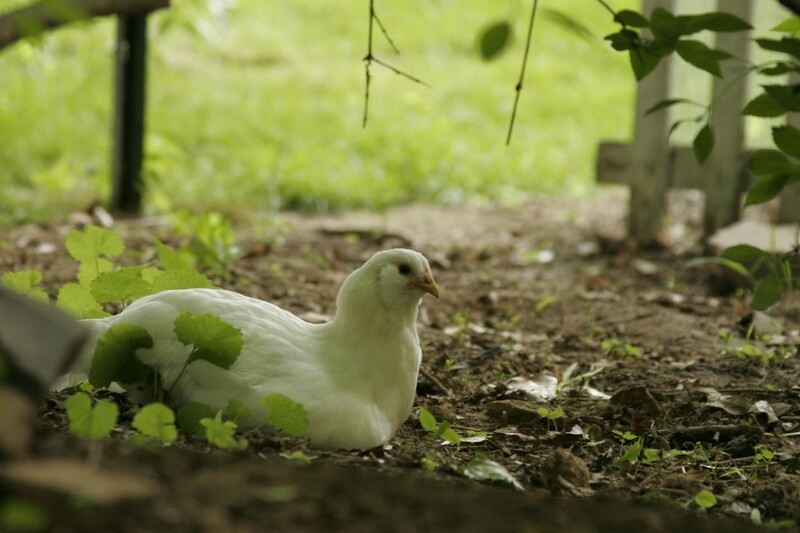 Place a mobile coop like the Eglu or Briar directly in the garden, between rows! You can also build your own chicken tractor, like the Garden Ark. A “tractor style” coop is a mobile coop with a small run that you move daily. This allows your chickens to access fresh pasture at all times. A tractor is not only for the lawn, though. You can also use a tractor in directly in your garden on the soil. In fact, it gets its name from the fact that a flock in a tractor coop will till the soil like a small, organic, sustainable garden tractor as they look for grubs and other tasty things. To keep your yard from being “tilled” like garden soil, simply move your coop every day or so, so they don’t wear down the sod. Using a chicken tractor probably one of the most foolproof ways to manage a small flock of chickens in a small yard. You can read details about the pros and cons of this management style in the My Pet Chicken Handbook. 3. Limit your flock’s garden time. 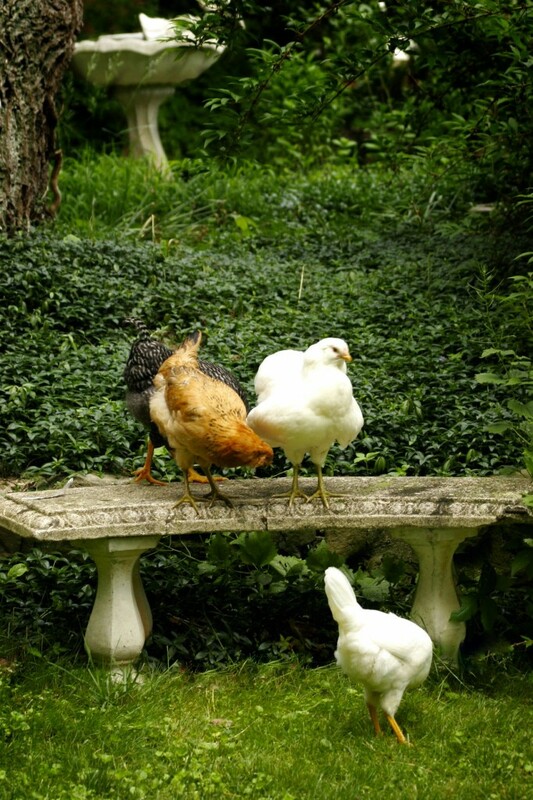 Once your garden plants are established, you might consider letting your chickens roam your garden in short, strategic sessions…. say, for an hour or so in the evening while you supervise, or perhaps while the garden is dormant in the winter. I can’t wallow a hole here while you’re staring at me! They won’t do much damage that way, but it will also allow them to decimate infestations of squash bugs and grasshoppers while depositing small amounts of fertilizer directly to your soil. As the sun goes down, they will retire to their coop. 4. Fence your chickens out of your garden, rather than inside a run. 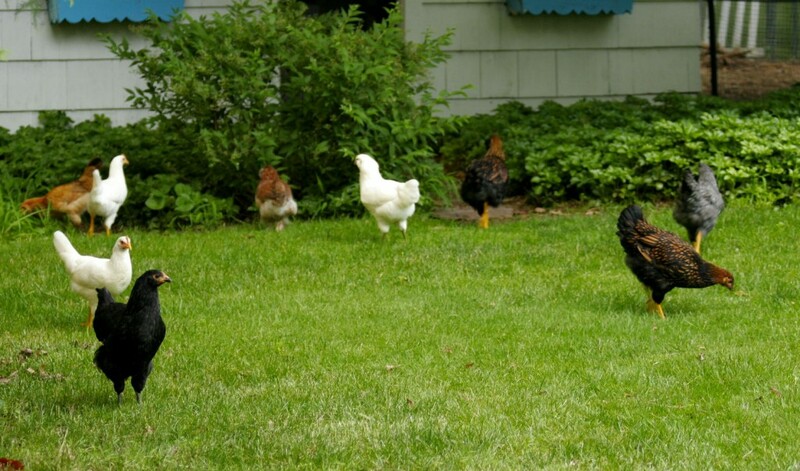 Another good choice is to fence your garden and let your chickens roam the rest of the yard. Why would you do this to me?!! Fencing can also protect your garden from rabbits and other pests. 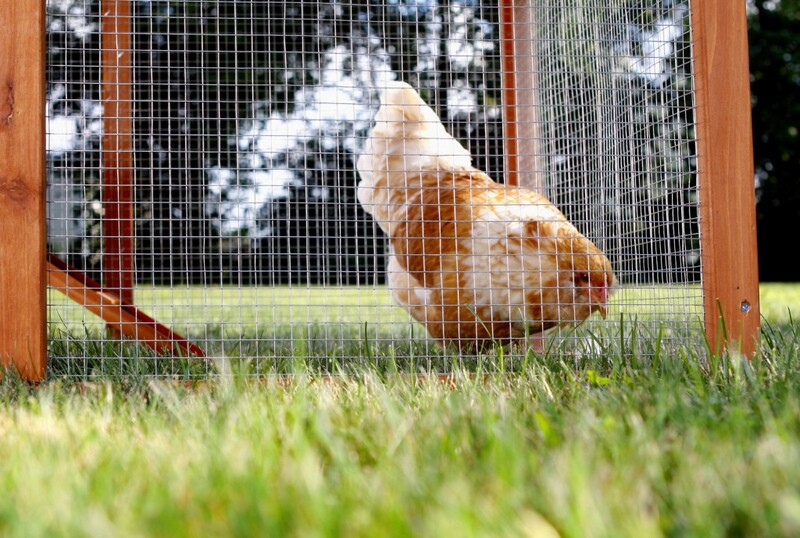 If investing in a permanent garden fence is not in your future, remember that with the docile breeds popular in most backyard flocks, most adult chickens can be excluded from garden areas with inexpensive plastic netting or chicken wire. Those products are too flimsy to protect chickens from predators, so they’re NOT what you’ll want to use to create a predator-proof chicken run! However, if your aim is simply to keep your chickens out of the garden or off your patio, they can work nicely. 5. Create a garden your chickens will ignore, and let them range. This is a technique that typically works only for landscape gardens—not vegetable gardens, alas. 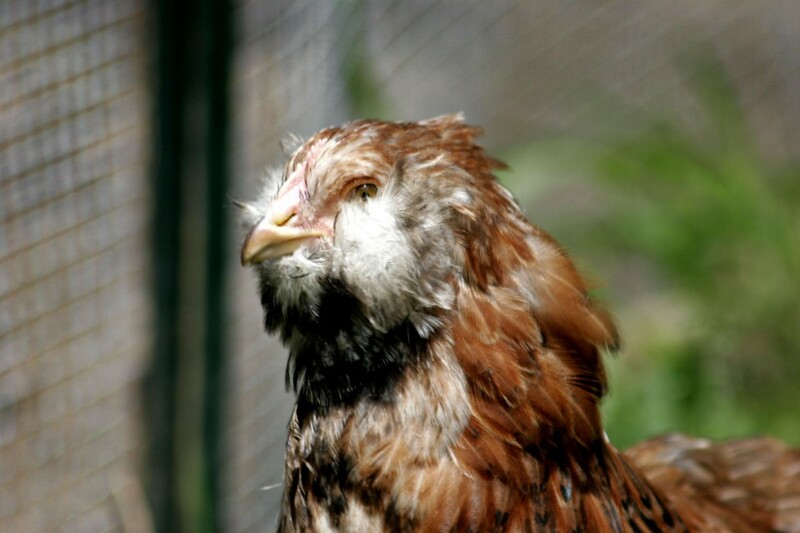 There are some plants chickens typically won’t eat… and can’t hurt much, once established. In my yard, my perennial herbs (such as oregano and thyme) are more or less ignored by the chickens. Both are tough plants that form a roost system sturdy enough to withstand scratching. Ivies and other tough but unappetizing ground covers can serve as place for chickens to forage for bugs without doing much damage. Like looking for “deer resistant” plants, though, this will probably require some experimentation on your part to see what works for your situation. And what works may change from year to year, based on what? The weather? Chicken perversity? You never can tell. For instance, my chickens always ignored my hostas, until two years ago. Then, they were decimated for no reason I could determine, except that perhaps they had “discovered” the hostas. But last year, they were ignored again. Creating a garden to ignore, along with the technique to keep your chickens from scattering your mulch without fencing, can work nicely if your interest in gardening is confined to herb or landscape gardens, but fails completely with nearly all the classic vegetable garden favorites, such as tomatoes, squash, and virtually any greens. What do you do to combine your love of chickens with your love of gardening? What works best for your family?